ORLANDO, Fla. (AP) — Francesco Molinari had seen so many clutch birdie putts on the 18th green at Bay Hill, most of them by Tiger Woods in the final group, usually with Arnold Palmer standing next to the green expecting like everyone else for them go in. It was Molinari's turn Sunday in the Arnold Palmer Invitational, with a few big differences. This putt was from 45 feet , longer than anything Woods ever made. And while it capped off an 8-under 64 and eventually gave Molinari a two-shot victory, the British Open champion had to wait nearly two hours to see if his score would hold up. "I was the first to make it with the flag in," Molinari said with a big smile, alluding to a new rule that allows the flag stick to stay in the cup with putts on the green. All that mattered was that it dropped, capping off a five-shot rally with a final round no one imagined on a fast Bay Hill course with putting surfaces that looked closer to white than green, making it difficult for anyone to get it close to the hole. "He's obviously holed a lot of putts to do that because you can't get close to these pins," Matt Fitzpatrick, the 54-hole leader, said after a 71 to finish second. "There's no way he's knocked it to 6 feet on every hole. But he played very, very well to shoot that, and hat's off to him." Fitzpatrick managed only two birdies, the same number as Rory McIlroy (72), who played in the final group for the third time in five starts this year without winning. McIlroy's downfall was the par 5s — for his second shots, he had 5-iron, 3-iron, 4-iron and wedge into the green. He played the four par 5s in 1 under. "I'm playing well," McIlroy said after a tie for sixth, his worst finish this year. "My Sundays haven't been what I would have liked, but I'm putting myself in that position. So good golf is good golf." Molinari delivered the highest quality on a day that required nothing less. His five-shot comeback was the largest at Bay Hill since Woods in 2009, which he won with a birdie from 15 feet on the 18th hole. He played the final 28 holes on this fiery course without a bogey. Only three of his eight birdie putts were inside 10 feet. Along with the 45-footer at the end, he holed a 20-foot birdie putt to start his round, an 18-footer that gave him the lead for the first time and he chipped in from 10 yards off the green at No. 8. And he ended it with a charge that would have made Arnie proud, and with the putt that has become familiar. 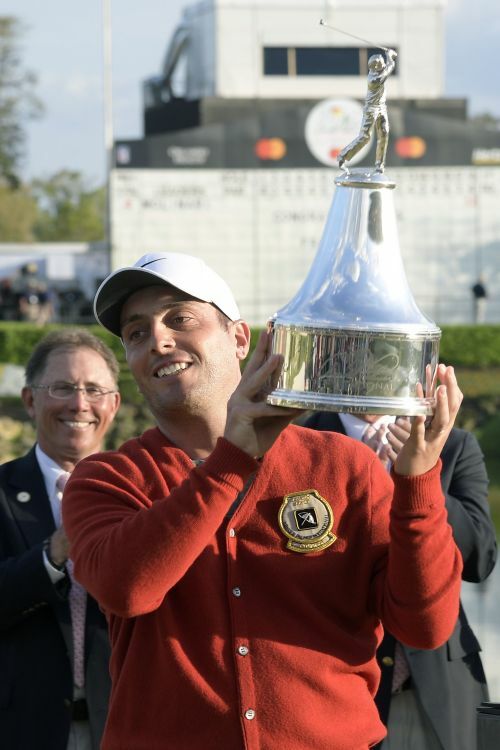 "Coming from Italy, we weren't exposed to that much golf," Molinari said. "Obviously, Arnie was such a global icon, and this tournament was one that we watched, my brother and myself, at home many times — watching Tiger making that putt on 18. So it's still a bit unreal to think that I've done kind of the same today." Molinari finished at 12-under 276, his fourth victory in his last 17 starts over nine months. No one got closer than two shots the whole time he was in the locker room watching the back nine, which was harder than he made his golf look. "I was just trying to hit good shots, give myself chances," Molinari said. "I knew it was not going to be easy. The course was firm and fast yesterday and I knew it wasn't going to be easy for the guys in the lead, so I thought there was an outside chance. And yeah, just started making putts, one of my best putting rounds ever." Molinari pointed to the first of his last four victories for sparking his turnaround. He played in the final round of the BMW PGA Championship at Wentworth tied with McIlroy, closed with a 68 and won by two. "It's hard to point a finger at one thing," Molinari said. "I think obviously confidence has to do a lot with it. When I won last year, playing with Rory in the last few groups, it wasn't easy at all. So from there I started building my confidence and just saying I could get it done." Molinari closed with a 62 to blow away the field in the Quicken Loans National. He played bogey-free on the final day at Carnoustie for his first major. He became the first European to win all five matches at the Ryder Cup. And he delivered a masterpiece at Arnie's place.